Zermatt sits on the Swiss/Italian border at the foot of the iconic Matterhorn - arguably the most photographed mountain in the world. 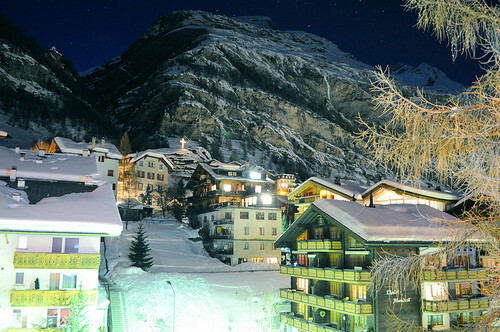 Our selection of the best hotels in Zermatt has something for everyone, from Le Petit Hotel, an affordable spot in the centre of town to the Monte Rosa, Zermatt's oldest or the Julen, a romantic hideaway with spa, pool and gym - not forgetting of course the Riffelalp Resort, Europe's highest five star hotel! A mountaineering centre since the first conquering of the peak in 1865, Zermatt is now a cosmopolitan resort with a plethora of shops, bars and restaurants and an ever growing number of hotels and chalets. Accommodation can be a tricky matter, with so many establishments claiming to offer top notch service and quality. 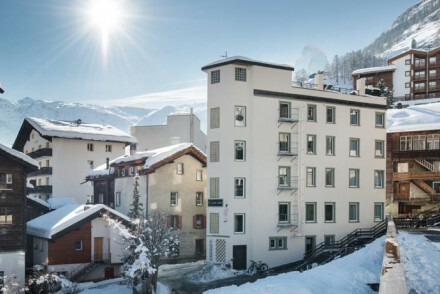 Our selection of hotels in Zermatt will help you sort the wheat from the chaff and choose the property that best suits your needs. 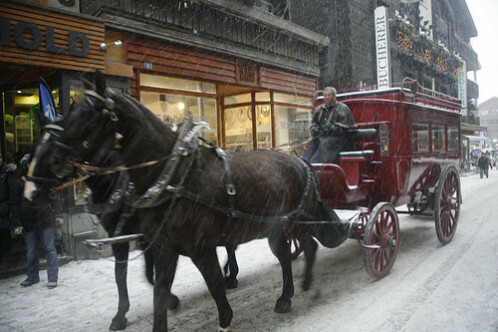 Car free (except of course for the electric taxis and horse drawn sleighs! ), the town is traditional and charming and the scenery is quite literaly breath-taking. 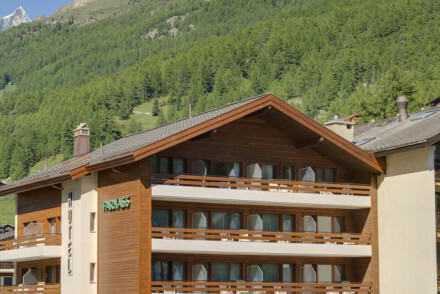 For hotels in Zermatt in the hub of the action try the ever reliable Perren or the family-run Hotel Parnass. A great budget option in the centre of town is Le Petit Hotel, an ideal base for those who like to spend their days on the piste and their nights in the clubs! 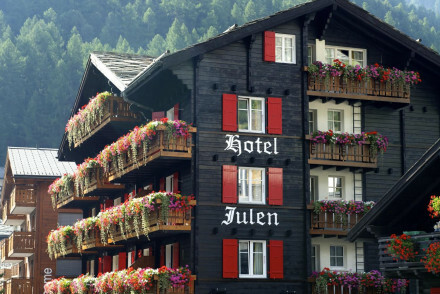 If your preference is for a romantic hotel in Zermatt, then give the Julen a go. Its large rooms and suites have deeply traditional pine clad walls, whilst public rooms boast zebra print on the chairs and antlers on the walls. There is also a three storey spa and romantic restaurant for diners a deux. An excellent choice for a three-star, centrally placed hotel. 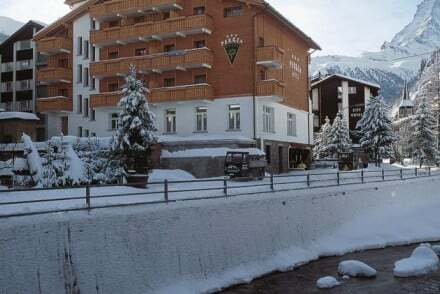 A traditionally decorated chalet providing comfort and mountain views, as well as a sociable lounge, restaurant and bar. The larger 'deluxe' rooms make an excellent choice for families. A small gym and sauna available for guest use. 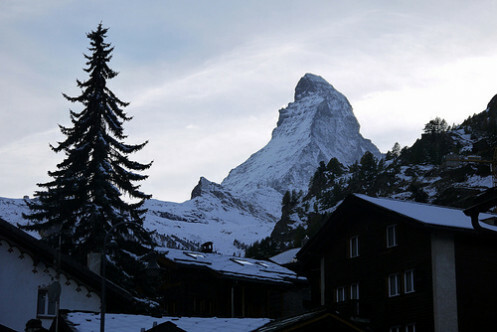 Active Holiday - Zermatt is renownded for its world class skiing and fantastic hiking trails. 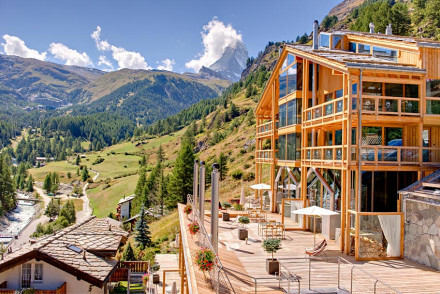 Friendly family-run hotel with stunning views of Matterhorn. Warm and homely, wood clad rooms with crisp white linen and cosy living areas. Excellent five course dinners are served in the dining room or garden. Exceptional value for money makes this an ideal choice for families and groups. Active Holiday - A world-class ski resort that caters for sporty guests in endless other activities such as hiking, biking and sledging. Value chic - A stylish property, with warm fires, library and garden, in a prime location offering very reasonable rates. 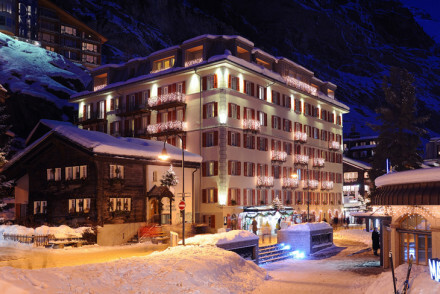 Located in the centre of Zermatt, Le Petit Hotel is a fantastic base just 150m from the main street. A rooftop terrace gives fantastic mountain views. Comfortable beds and cosy bedrooms. Ideal for those who spend most of the day on the slopes and the evenings out. A good value sleeping spot. Active Holiday - A world class skiing resort with 400km of hiking routes in the summer months. Romantic family-run hotel full of personality. Large wooden-clad rooms and suites with romantic decorations and splashes of bright colour. Sheepskins, flowers, and antlers adorn the public rooms. Lovely restaurant and bar, and a three-storey spa, pool and gym. A cosy Alpine base. Total relaxation - Unwind in style off piste with three story spa, sauna and steam baths, followed by cocktails and fine wines. Zermatt is rightly renowned as one of worlds' top winter resorts with some 360km of pistes, including 20km on the Theodul glacier and plenty to satisy the most determined powder hounds, with north facing slopes ensuring good off piste conditions. Snow sure, it offers a great range of terrain and slopes, however the downside is that these are split into four distinct areas, which can mean quite a lot of tramping across town. For those looking to expand their repertoire beyond the slopes there is plenty on offer from paragliding and ice climbing to toboganning and snow shoeing. If you want to literally fall out of bed onto the pistes then amongst all the hotels in Zermatt there are only two choices: the Fluhalp, a traditional mountain chalet only accessible on skis or foot, or the luxurious Riffelalp, situated high above the village with access from the second stop on the Gornergrat railway. Traditional Alpine mountain inn accessible only on skis or by foot. In the winter, it's only the restaurant that is open. Late June to October, great value for money and perfect for groups - you can choose between four bed rooms or dormitories. Ideal as an overnight stop off. Groups - Fluhalp has a variety of acccommodations ranging from 4 bed rooms to dormitories - ideal for trekking groups. Remote - Accessible only by skis or on foot! 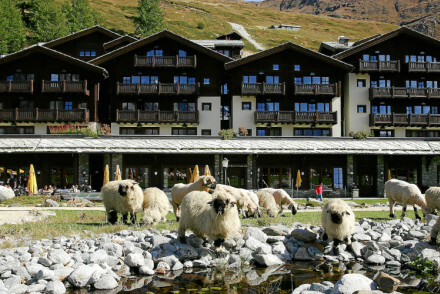 Accessible only by mountain rail or path, the Riffelalp is Europe's highest five star resort. Traditionally styled rooms feature pine clad walls and large glass windows. Expect a unique and breathtaking panorama facing the Matterhorn, plus three restaurants, spa and luxury as standard. Spa breaks - Pamper and indulge in the on site spa with schonbiel cave, Finish sauna, massages and Chriiter-Grotta. Active Holiday - Endless adrenelin fuelled activities in the surrounding area plus many inhouse activities. Swimming Pool - Outdoor and Indoor. Perhaps not considered the most family friendly of resorts, Zermatt actually caters very well for younger family members. The Zermatt ski school operates the Snowly Snow Club, which offers full day programmes for 4-12 year olds. In addition there's a kindergarten offering creche facilities for the very young a stone's throw from the railway station and several hotels run their own childcare programmes. 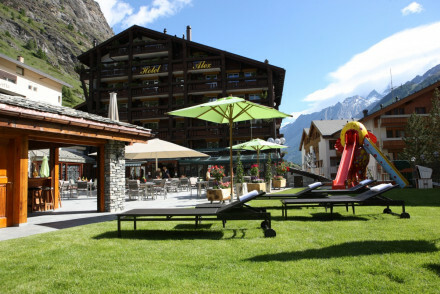 Our choice of the best family friendly hotels in Zermatt include the Alex, a family run property with children's playground, large pool, indoor tennis and much more! The tradtional Monte Rosa is another good option. It oozes old world charm, and has a great central location, plus several suites which would be ideal for a family group. Historic and quirky family-run hotel with bags of character. Modern bedrooms and luxury suites with hand-turned furniture and exquisite wood carvings whirl-pool baths. Sociable bar, large pool, and a children's playground. The perfect choice for families. Active Holiday - With skiing on your doorstep plus tennis and squash courts, grotto swimming pool and gym on site, this is a sportsmans fantasy. Spa breaks - A lovely spa to unwind in after a day in the great outdoors featuring saunas, massage rooms, a tepidarium and a sanarium. 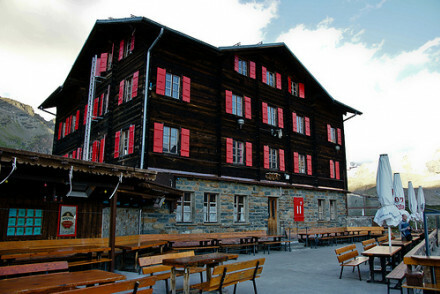 Zermatt’s oldest, most historic hotel. Delightful private balconies and classically styled rooms in neutral tones. A cosy drawing room and sumptuous fine dining room with gorgeous chandeliers. An excellent family-friendly choice for a destination with old world charm. 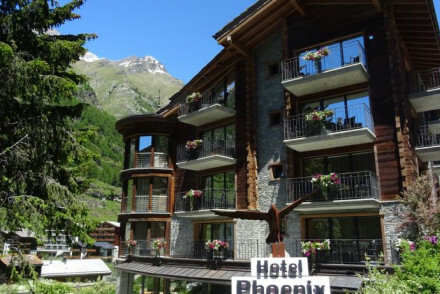 For those of you who are fed up with the traditional chalet look and want something with a more contemporary feel check out the Coeur des Alpes or the Phoenix. An increasing number of hotels in Zermatt are looking to offer a modern edge to their interiors. Constrained by local authorities to keep any new exteriors classic, the instinct now is to create ever more innovative spaces inside. The Coeur des Alpes is still a chalet (albeit an incredibly modern one), but boasts stunning interiors including a glass floor in the lobby with views down to the swimming pool below. The Phoenix offers contemporary yet rustic style - think quarry stone mixed with rustic wood, all complemented by huge picture windows for soaking up the views. Glamour and intimacy combine to create this scintillatingly contemporary chalet. An impressive lobby with a glass floor that reveals the swimming pool underneath. Bedazzling designs - glass, wood, stone, steel, and chandeliers make up the rooms, suites and lofts. A grown up mountain escape. Spa breaks - A glorious spa with a hammam, caldarium, bio sauna, arvensauna, kneipp pool, infrared sauna and outdoor hot tub. Active Holiday - Situated in a world renowned alpine resort with hiking, biking, skiing, sledging and much much more. Swimming Pool - Luxury indoor pool. A stylish contemporary hotel - both functional and characterful, rustic and peaceful. Deluxe rooms overlook the Matterhorn. Enjoy an apres ski drink in the attractive bar with quarrystone, rustic wood, and lots of natural light. Great value for money. Families - Located in the quiet Wiesti quarter, but within a ten minute walk of the action- ideal for parents with young children. Great walks - Wander along the wooden walkways to view the Gorner gorge. Views - Of the Matterhorn. Zermatt has a thriving Après Ski scene too. 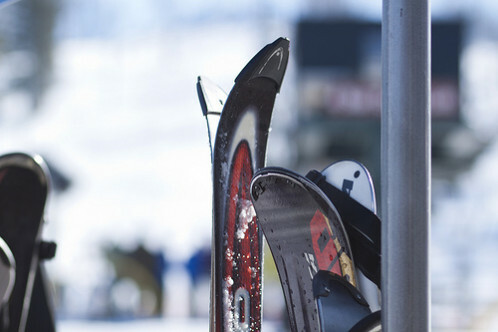 There is a huge choice of hostelries both on and off the slopes. On the mountain it is always worth checking out the Fluhalp with its fabulous terrace and live music or perhaps Chez Vrony with its organic mountain specialities. Once back in town, head down to the Hotel Post which offers a selection of bars including the Broken Bar Disco which has become something of a legend. Alternatively for something slightly less raucous we suggest the Vernissage. 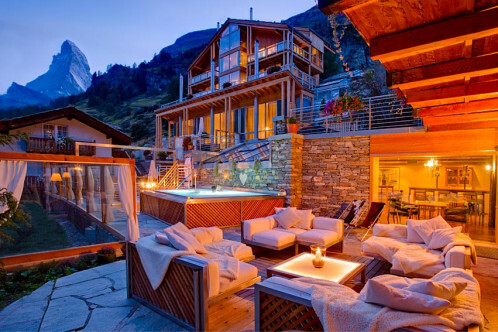 If you haven't set your heart on something from our selection of the best hotels in Zermatt, why don't you see if there's a hotel in Verbier you might like.